I've done another design following some inspiration on the Modcloth website. This time I used a dress called Cool Breeze. I started with a white base and then sponged on some navy blue tips. My blue polish was a little more green toned than the blue in the dress, but they still matched nicely. I then did some advanced stamping, or reverse stamping (I'm still not sure which is the right term for this) where you stamp onto the stamper, then colour it in with some polish. 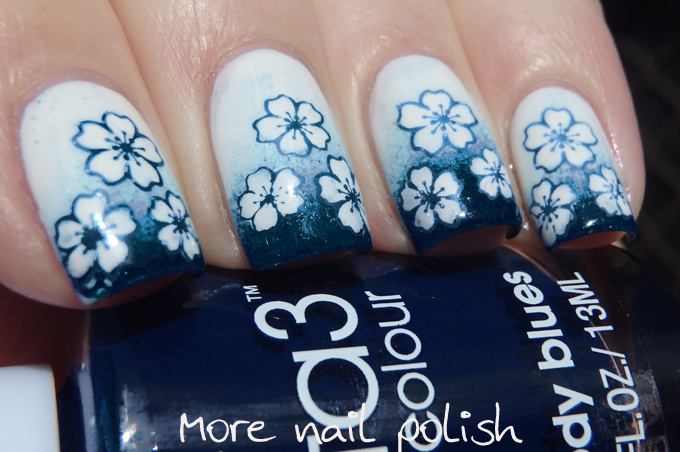 After that has dried, you apply a layer of top coat, wait for it to be 90% dry, and then press the stamp on. The main difference between this technique and creating stamping decals is that you don't top coat the design on the stamper and peel it off like you do with decals. The flower I used are from Moyou Suki 01 plate. I really like how this one turned out. 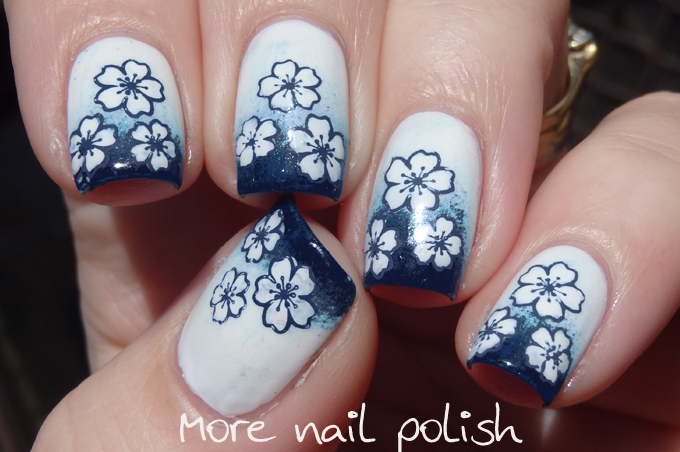 I think I need to get some more stamping plates with flowers on them, I don't seem to have many designs with flowers. Absolutely perfect! What a great fashion match! So with this technique you paint the stamp on the stamper, and apply the top coat on the nail. When the top coat on the nail is 90% dry then you press the design on with the stamper? Yep, that's it exactly. With Seche Vite, I wait about 1 minute before pressing the stamp down. You also need to make sure the polish on the stamper has dried too. Obviously it's a slow process if you only have one stamper, but with the whole set I just got it means I can have lots going at once. This is just gorgeous. Choice of colour, design, execution... Everything looks so beautiful. My god you're talented, that's just stunning. 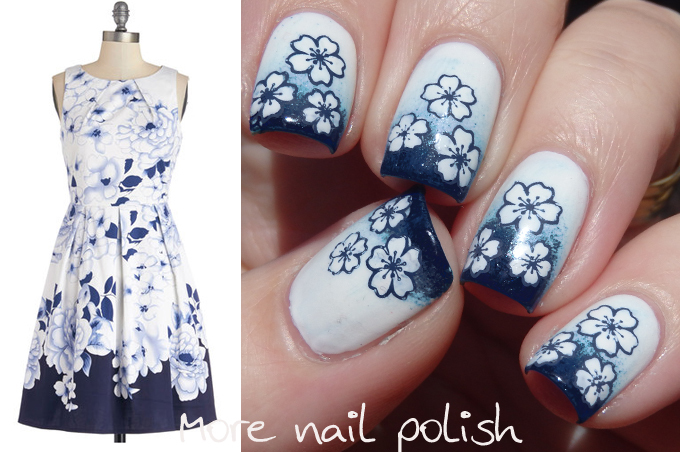 This manicure is oh so perfect in every way! Kitties, I really, really enjoy fashion-inspired nail posts! Thank you so much for your creative inspiration today! 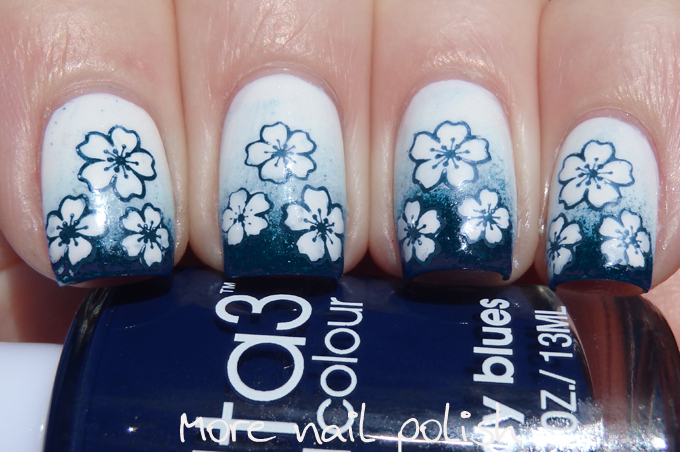 The flowers first stamping is blu or white?? ?